A specialist in its field of application - The TeamMaster UMEX is the ideal choice when it comes to protection from cryogenic substances or hazardous materials in cold surroundings. 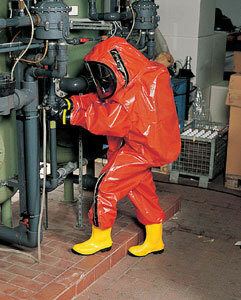 The Drager TeamMaster UMEX is a fully encapsulating, reusable, gas-tight chemical protective suit. It fulfills all requirements of EN 943, Part 1. The suit protects the wearer and all his PPE, e.g. helmet and breathing apparatus, from gaseous, liquid, aerosol and solid hazardous materials. The suit fabric, UMEX, features the highest wearing comfort and good mechanical strength. Its flexibility makes the Team- Master UMEX ideal for operations with cryogenic substances and very cold surroundings. Using a modular system, the components of the protective suit can be arranged to suit specific customer needs. A choice of 4 different suit sizes is available. Each size can be ordered in a wide cut for the use of a twinning system breathing apparatus. The suit is equipped with a gas-tight PUR closure system with an external metal chain. The Drager TeamMaster UMEX comes with an internal radio pocket as standard. The protective gloves and safety boots are chemical-proof and easily replaceable. The suit can also be equipped with gastight socks instead of integrated safety boots. The visor is made of a special PVC material and can be combined with an anti-fog visor and an additional outer visor. Furthermore, the suit can be equipped with a guidance and orientation line adapter. The ventilation system RV PT 120 L enables the user to cool himself with an adjustable stream of fresh air. It also reduces the humidity inside the suit. Moreover, the Regulation Valve PT 120 L can be connected to an external air source. By doing so, the user can be supplied with additional breathing air to extend the operation time or to gain more time for a thorough decontamination.